Proof that the best way to beat Marcel Kittel in a sprint is to bin him long before the finishing straight. As I said before the race, the German tends to fade a bit as the days go by and he struggled on the first climb of the day. Seeing this, Michael Matthews’ Sunweb team pushed on to ensure he couldn’t return. It was a profitable venture for Matthews secured a full house: 20 points at the intermediate sprint and 30 for the win at the finish. He is now only 29 points behind Kittel in the green jersey competition. A word too for Edvald Boasson Hagen. Second to Marcel Kittel on stage seven by 6mm (the official measurement), here he lost to Matthews by about a foot, but he was moving so damn fast that given another half-second of racing, he would have zipped past. John Degenkolb was third and looked pretty pissed off with how Matthews had sprinted. Matthews says he grabbed him by the neck after the finish line. They may be invisible, but crosswinds are unarguably the finest way to create drama out of literal thin air. If the wind’s strong enough, echelons form and the peloton will start to split. Drafting can kill the spectacle of bike racing, but a good sideways gust can all but negate it. Kittel’s team-mate Dan Martin was the wrong side of the splits in the final 20km. His group wasn’t as quick as the front group and he lost 51 seconds, slipping down to seventh overall as a consequence. Today is the day isn’t it? 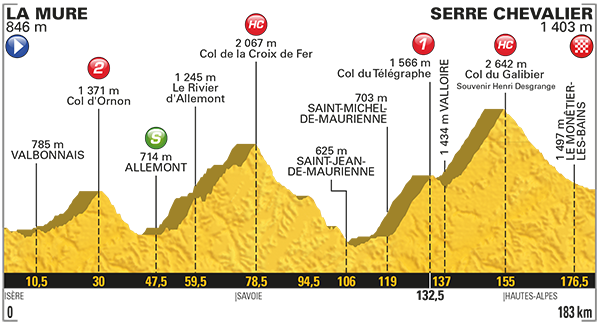 If the other contenders can’t put a minute over Froome by the end of stage 17 the race is out of their control. 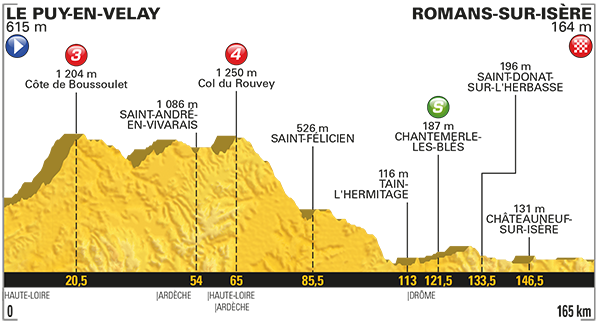 Stage 18 summit finish offers a better opportunity in theory, but you’re right that anyone who lost time to Froome today isn’t exactly going to be confident of gaining time a day later.